Server for Computer shop, Dental clinic and Cafe management software. When you first time start server, you will be asked to enter Administartor password. Please enter some password, and remember it, because you will not be able to lock server if you do not know password. 'Lock' button. Hides log from the screen. You need to know administrator password to use Lock button. 'Save log' button. Save current log into file. 'Change admin password' button. You need to know current administrator password if you want to change it. NOTE: If you lock administrator software, next time when you start it, it will be locked. 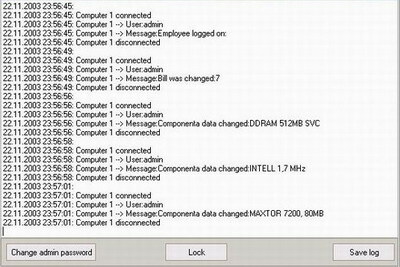 NOTE: If you try to turn off locked Computer shop server, you will be asked for administrator password. NOTE: Server will start minimized. IMPORTANT: Server must be started before you start client software, otherwise client software will not work.